Does Coconut Oil Help Acne? Lots of natural ingredients are bad for skin, and just as many are great for skin. Coconut oil is one of those great ingredients, but does coconut oil help for acne? Exciting news: It might help, but…it also might make matters worse. For certain, though, research has not shown that coconut oil is a replacement for or works better than the one-two punch of benzoyl peroxide and salicylic acid. Although coconut oil is certainly a heavy-feeling ingredient to leave on oily, acne-prone skin, it does have some potential to help acne. The main fatty acid in coconut oil is lauric acid, a medium-chain triglyceride, or MCT. 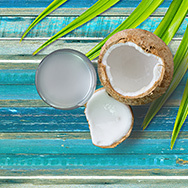 Coconut oil contains over 50% lauric acid, making it the largest natural source of this intriguing ingredient. Research has shown that lauric acid has antimicrobial and calming benefits when applied to skin, including against the specific strain of bacteria that plays a role in triggering acne. The same has been shown to be true, although to a lesser extent, for capric acid, another fatty acid found in coconut oil. However, neither ingredient is considered a proven acne fighter by any cosmetics regulatory agency. Although the lauric acid found in coconut oil appears to play a role in fighting acne, the other side of the issue is that coconut oil contains a lot of saturated fat. That’s why, at room temperature, coconut oil is semi-sold, similar to butter. The saturated fat content of coconut oil liquefies when warmed to body temperature, but the concern is that it may revert to a semi-solid state—and could get stuck in the pore. If your skin is already oily and not exfoliating properly on its own, adding the saturated fat from coconut oil isn’t likely to improve breakouts or clogged pores. What About Coconut Oil Cleansers for Acne? Some cleansing oils sold today contain coconut oil and are labeled for all skin types. What gives? Although we don’t recommend using pure coconut oil to cleanse acne-prone skin, a face wash or water-soluble cleansing oil that contains a small amount of coconut oil shouldn’t be a problem. Some face washes and cleansing oils contain emulsifiers, a type of ingredient that allows the oil to benefit skin (smoothing, preventing dryness) but then can be washed off before it mixes with your skin’s oil and potentially clogs pores. Such formulas can be great for acne-prone skin, especially if it’s suffering from flakiness due to topical acne treatments.